35 acres along Eld Inlet on the Steamboat Island Peninsula in Thurston County, northwest of Olympia. This property is unique in its diverse habitat types, ranging from forest, to shoreline, to grassland. Due to the diverse habitat the property boasts an array of wildlife, including bald eagles, great blue heron, green heron, red-tail hawk, cooper’s hawk, pileated woodpecker, Northern saw-whet owl, Western screech owl, and red-breasted sap-sucker in addition to deer, red fox, coyote, and occasionally black bear and cougar. The Eld Inlet shoreline has also been identified by the State of Washington as having ecological significance, providing habitat for wild chinook, coho and chum salmon. 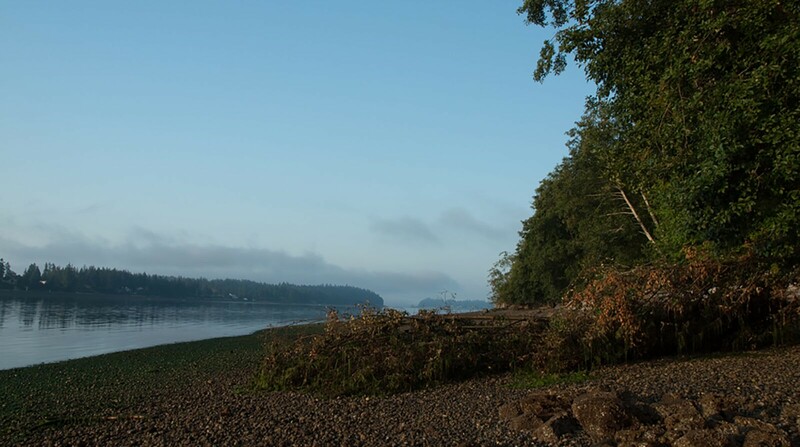 Extensive tidelands, more than 800 feet of Eld Inlet shoreline, and a mix of forest and grasslands comprise the latest conservation easement negotiated by the Capitol Land Trust. Located at the northern end of the Steamboat Island Peninsula, the property was once known as Schirm Farm. Land owner Bart Schmidt worked with the Land Trust to donate an easement assuring the shoreline and upland habitat will always contribute to the health of the unique ecosystem. The combination of mature forests, open fields, marine shoreline and tidelands provides habitat for a rich variety of plant and animal species, and numerous resident and migratory birds. Mature western red cedar, Douglas fir, and big-leaf maple dominate the forest. A pair of bald eagles are year round visitors to tall trees near the bay and have even been sighted catching squirrels on the roof of the house. The diverse property provides habitat for great blue heron, green heron, red-tail hawk, pileated woodpecker, northern saw-whet owl, western screech owl, red-breasted sapsucker, several bat species and flying squirrels, as well as deer, red fox, coyote, and the occasional black bear and cougar.